In this page you will find some examples of real benefits using web and digital marketing technologies. We have a huge list of real case studies for internationally famous brands. Big consulting companies already use our services as "ghost workers". We solve problems for them and we are both happy. Feel free to contact our team today and ask for any information. For this fashion company we created a full-service web strategy: Google Analytics to measure ROI, a complete SEO campaign, massive Google AdWords campaign (standard and remarketing), Social Media support campaign with events and goals monitoring. Goal achieved: almost 5 millions euros in one quarter. This is a nice graph that shows our SEO progress and success. We have been working hard with this client for five years. Goal achieved: more than 8000 users / month. We completed an advanced SEO optimization for this finance company. +45,79% of web qualified traffic, from 246.587 to 359.489 power users. 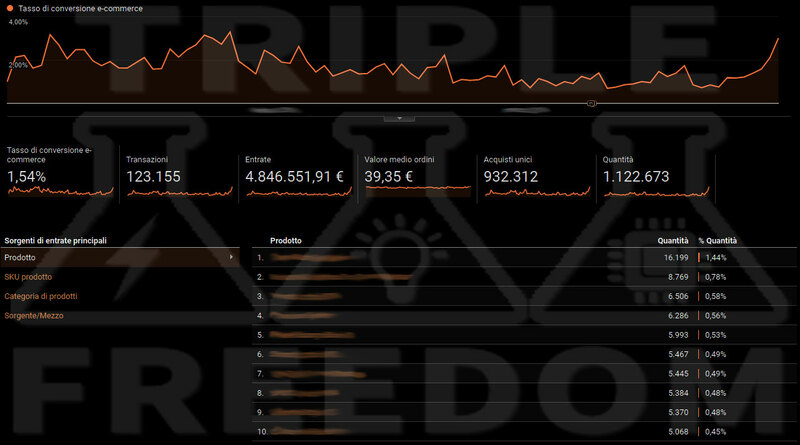 We optimized this campaign of about 6000 euros / year. Goal achieved: look at the CTR parameter, that number means qualified leads and sales conversions. Here we talk about a motorbike company. This graph shows a brand awareness project and the numers talk themselves. From 9.700 to 116.951 fans in just 12 months, with a very light budget. Our competitors show off brands to gain trust. We prefer to light up our numbers to make you understand what we really do. Contact us and we will give you more details if you need them. We don't use tricks, just hard work and a lot of experience in the digital field: web design, seo, online advertising and social media marketing to stand out from the crowd. All digital channels must be handled carefully because budgets are always very short, both on ecommerce and social media marketing. All examples above are the results our commitment.